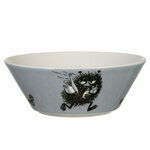 Moomin bowl Stinky by Arabia presents the mischievous villain of the Moomin Valley. Stinky spends his days doing pranks and tricks, stealing and teasing others. The ceramic Moomin bowls cheer up any table setting, and their simple design is great for serving soup, cereals as well as desserts.